Driving from Denver, Colorado, to Santa Fe, New Mexico, with stops back and forth in Taos and Abiquiu–Ghost Ranch (to pay homage to Georgia O’Keeffe), I am constantly reminded that this land was once Mexico. The landscape reminds me of Oaxaca: expansive with arroyos, crevices, looming 12,000 foot mountains, scrub oak, sign posts telling of land grants established soon after the Spanish Conquest. My pilgrimage to visit friends along the way embellished my road trip adventure on the back roads of America’s Southwest. In Taos, my friend Winn gave me a list of thrift and consignment shops to visit in Santa Fe. She said sometimes there is Native American jewelry, too. That hooked me! This is especially interesting since Santa Fe is that eclectic mix of old-timers who have been there for forty years (and collected a few things), and socialites who come for the summer season. They might be oil and gas heiresses from Texas and Oklahoma who seek a milder summer climate. They come for the opera and the markets: International Folk Art Market, Spanish Market, and Indian Market. Artifact. 930 Baca St., Santa Fe. (505) 982-5000. 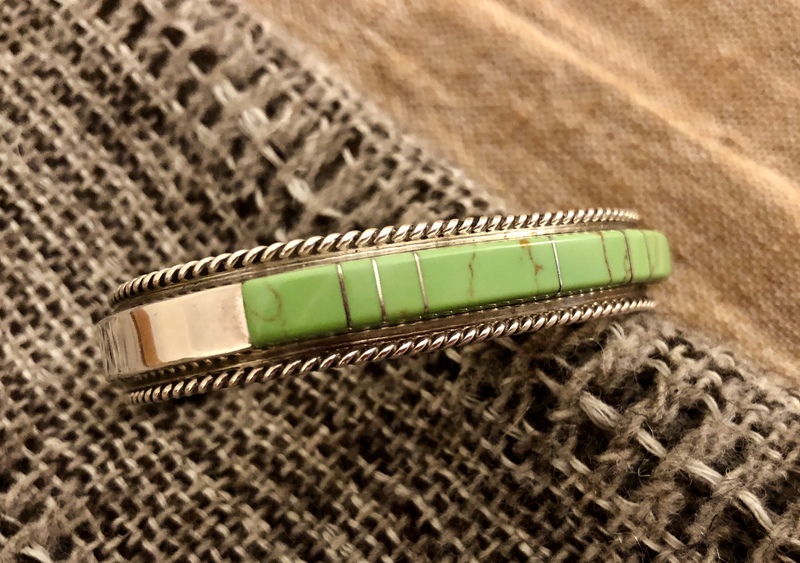 I found a vintage Navajo sterling silver cuff inlaid with gaspeite, and a brand-new skirt hot off the rack from the Plaza at a fraction of its original price. Doubletake. 320 Aztec St. at the corner of Guadalupe St., Santa Fe. (505) 989 – 8886. This shop is in two parts: amazing Native American jewelry, accessories and furniture; and clothing. Look What the Cat Dragged In. 2570 Camino Entrada. This shop benefits the Santa Fe Animal Shelter. I never made it here! Hopefully you will. Let me know what you think. If you are destined for Santa Fe this summer to volunteer or attend the International Folk Art Market (or any of the others), you might find this bonus thrifty shopping itinerary worthwhile. I did! This entry was posted in Cultural Commentary, Folk Art and tagged consignment shops, New Mexico, Santa Fe, thrift shops. Bookmark the permalink. I am glad you found some great things while in Santa Fe. I will be joining Winn there for Labor Day weekend. Then on to Taos where we visit even more thrift stores. New Mexico is such a wonderful place to be! In Taos, you need to go to Pieces! Norma, I was just there! I wish I had had your list! We loved Abiquiú and touring Georgia Okeeffes home. Remind people to buy tickets ahead of time online. I saw lots of deeply disappointed people at her fabulous new welcoming center that couldn’t get tours. Ghost Ranch was amazing and hiking the White Place near her home was magical. Ah, hah! Maybe that was me at the Welcome Center, begging for a ticket but to no avail! I reserved a night at Ghost Ranch and the morning walk/hike to her painting sites. Had no clue I needed reservations for the Abiquiu house. LOL. So, I will indeed return, too. Yes, see you in March. Chiapas here we come! Yes be sure and go back to your her home. The tours are small only 12 people and they begin in her studio! It’s amazing! Yes Chiapas here we come! Thanks Norma I will be heading into Santa Fe for the Indian Market in August and will bring along your list. Super, Linda. Also check out the big open to the public sale at Peyote Bird that weekend. What a fun post to read and good score on that cuff bracelet! I’d love to check those shops…esp. Look What the Cat Dragged In! Let me know what you find, Jan. I am trying to access your site in order to purchase a pair of earrings that I believe are still for sale. I am having difficulty. How do I communicate with you or is this a good way to contact you, Norma. Please email me in order to start a purchase if that is possible.